Papyrus is the world’s first scalable blockchain protocol specifically designed to fight all digital advertising issues - fraud traffic, brand safety issues, excessive middleman cuts, and absence of supply chain transparency. Unlike other existing blockchains it has unique features that make it feasible solution for practical adoption: low transaction costs, privacy management, execution of smart contracts based on large volume of data. 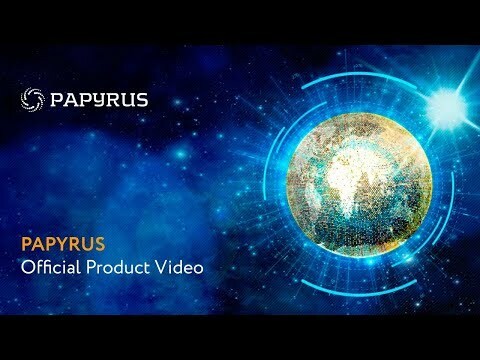 On top of blockchain platform Papyrus provides decentralized monitoring and money flow management tools to digital advertisers and publishers, which help them to get visibility on third parties and ad agencies, fight fraud, control money streams and optimize supply chain efficiency. These tools cannot be manipulated by any parties: data for monitoring is stored immutably, money flow management rules are automatically enforced by smart contracts. For example, advertiser can enforce automatic rules that say “fraudulent traffic won’t be paid for and brand safety violations will imply penalties for abusers”. Verifiers connected to the system provide data to verify these rules while blockchain guarantees their enforcement. By providing these tools Papyrus creates transparency, trust and efficiency within digital advertising supply chain. Papyrus is a neutral solution that doesn’t compete with ad platforms and service providers while brings benefits for all of them unless they are making money in gray area. Papyrus is a universal blockchain platform specifically designed to overcome the challenges of digital advertising. Papyrus connects advertisers, publishers, agencies, advertising platforms and verifiers within the Papyrus blockchain network to create trust, fairness and efficiency within the digital advertising market. Papyrus has launched its Technical White Paper and MVP that consists of an advertising network using blockchain architecture to enable the transparent purchase of advertising inventory. All calculations between advertisers and publishers are controlled by smart contracts with automatic restrictions on payments depending on the quality of results as verified by independent verification service suppliers. The MVP is deployed on Ethereum TestNet Rinkeby and will be launched in Ethereum MainNet after the second Token Generation Event. The Papyrus Channel Layer is the key feature of the MVP, executing smart contracts over large datasets collected by network participants. The launch has made it possible to test the scalability of the Papyrus solution and prove its applicability to the programmatic ad market, where the number of ad impressions reaches billions every second. Scalability on data and low infrastructure costs are what differentiate Papyrus from other blockchain solutions. Later this year, Papyrus will launch its open-source blockchain network where the current MVP will be migrated. The Papyrus blockchain network will be an Ethereum fork, which will reduce the cost of smart contracts execution and ensure transaction privacy using dPoS consensus and zero-knowledge proofs. It is a necessity in the advertising market, as media buyers want to keep the structure of their spending confidential. The network will also provide Papyrus developers with a more flexible architecture for modification. Due to its data scalability and privacy protection capabilities, the Papyrus blockchain architecture offers an extensive range of use cases not only within the advertising industry but for all business applications requiring the secure execution of smart contracts based on large data sets and their analysis, notably with AI models. The potential market for the Papyrus network is enormous. In addition to improving the advertising ecosystem, it can be applied to build high-frequency trading solutions backed by smart contracts, automatic loan issuance based on dynamic scoring, and many other scenarios, including in the Internet of Things market. Papyrus is a scalable blockchain protocol and platform for execution of smart contracts against large data sets. On top of this platform Papyrus builds a programmatic ad buying solution addressing the major problems of the digital advertising industry. By securely and privately tracking trillions of impression-level events per day and applying smart contract-based ad verification and payment settlement logic, the solution creates transparency and trust between ad market players, provides visibility into end-to-end payment flows, reduces operational costs, eliminates fraud and increases ad quality, ultimately improving end user experience. 1. Channel layer - an off-chain mechanism for collecting, securely storing, verifying and processing raw business transactions data (in particular, execution trace of RTB protocol). 2. Papyrus blockchain - a consortium dPoS blockchain based on Tendermint BFT consensus algorithm, with support of EVM smart contracts. It backs the operation of channel layer and implements ad campaigns business logic including ad verification and payments settlement rules. 3. Cosmos Network integration - the Papyrus blockchain is built as a Cosmos Zone, connected to the Cosmos Hub to benefit from ready interoperability with existing public blockchains. 4. Dashboard applications providing access to the Papyrus functions for advertisers/publishers, and integration tools for onboarding existing adtech platforms. Papyrus - scalable blockchain protocol for digital advertising industry is redefining now the digital advertising marketplace. "Unlike other existing blockchains it has unique features that make it feasible solution for practical adoption: low transaction costs, privacy management, execution of smart contracts based on large volume of data." With global advertising at +$100 billion, there is a great market for this ICO although there is also great competition. Adding strategic partners could make the ICO more credible and contribute to its success. Not a new concept. Several ICOs have launched in this space. C1. I would like to invite Alexander Shvets and Elena Obukhova to undergo the ICOBench's KYC. I would like to also have a point-by-point reponse to each of the comments by SCO. C4. Regarding "Papyrus Foundation Pte. Ltd.", who are the directors and shareholders for this company? C5. Within ICOBench, Igor Alferov is listed as the Founder and Abeed Janmohamed is listed as the CEO. However, both are missing in the official whitepaper. Why? C6. I will revise my ratings after receiving further responses to above issues & ICOBench KYC. Thank you for your interest to our project and for your comments! We would like to answer your questions and clarify the main points. 1. Alexander Shvets is our Product Director (https://www.facebook.com/ashwets?fb_dtsg_ag=AdzHdXfJnf45LRuFdI7skcsFFP41Vu16_10vVolWMuhDJw%3AAdwZnSbTI9Ob4O_d858-1jh6D-wffft8YhoaOfF1Qk8TCg and https://www.linkedin.com/in/ashwets/. Elena Obukhova was Communications Director in Papyrus, since June 2018 she became COO for Papyrus ( https://www.linkedin.com/in/elena-obukhova-9312a3a9/ and https://www.facebook.com/elena.obukhova.94). All the team-members are real, we don't have any virtual participants. Our team-members work for Papyrus more than 1,5 year and always open for the communication. ICOBench asked Igor Alferov and Abeed Janmohamed to pass KYC and they did it. Elena and Alexander could also pass KYC, but it's not possible to do it without ICOBench initiation. 2. Yes, our official telegram group was started more than 13 months ago and now has a number of 24 000 people. 3. As for SCO, we like their funny stories and the original point of view, but unfortunately in this case they clung to the project, which is really focus on the development of serious technology and a product needed for the industry. Unfortunately they never reached to our team for any comments and never tried to meet us at conference events. It is naive to expect immediate large scale market adoption of such innovative technology. We are targeting B2B marketplace, where sales cycle usually takes multiple months. And we already doing live pilot integrations with Smarty Ads and some other partners. Also we keep most valuable pieces of our technology private, including scalability solution, to avoid replication by our competitors. So our GitHub cannot show observers entire work that happens currently. We do not prefer to be among the "victims of the industrial espionage". We would be happy to arrange a meeting and answer any questions first hand. 4. Papyrus Foundation Pte.Ltd. was founded by Igor Alferov on September 15, 2017. All the information about the company is public and available in official registry. 5. You are referring to our original white paper published in July 2017. At this moment Igor was under NDA with his employer and Abeed haven't joined the team yet. Currently Igor and Abeed are completely focused on the project. We will be happy to make you our technology presentation and answer all your questions! Btw we will be at the biggest adtech event in Cologne - Dmexco on 12-13th of September. Everybody is welcomed to come to our booth and talk. Best, Elena Obukhova, COO and Communications Director on behalf of Papyrus"
C9. Do let me know once you've filled in Google doc, pls reply to this review again and I'll further adjust the ratings accordingly. A team member reached out to me on LinkedIn, was very respectful, professional and was able to communicate how they are different from the competition and why this is of importance along with other relative information. Due to the communication and new information, I have updated my rating (increased rating). Good luck with your project, and wish you success. On my opinion, after reading some of the ratings and viewing the white paper, I don’t find this project to be a great project but rather just an ok project for the time being. I get it, first movers advantage right? Everyone wants to be the first, but this isn’t always the greatest idea ‘myspace’.... I mean Facebook. Honestly.... I have no idea how this project managed to get such a high rating. Only one member has a profile on LinkedIn which can be viewed. The team fails to prove the justification of the funding. They address the problems correctly but the way solving them is confusing and irrelevant. Even if they partly solve the problems associated with digital advertising there is still a big chance that there will be one more failed project. After a discussion that I had with the communication director of the project I found out, that LinkedIn profiles of the team members are accessible. The director was very kind and helpful. The way she talked to me made take this project seriously. The truth is though, that the project will face many difficulties and I am not sure if the team will be able to deliver. Good to see anti fraud solutions forming secure information platform for advertisers. It's a great platform that can be utilized to prevent corruption by limiting the long chain of mediators that certainly hike the budget for ad. I see many more advantages of this project as mentioned in whitepaper. Providing a 360 degree incentivized system, this platform may address problems in the existing system. - Full comparison shown with similar existing projects in this space. - Tough competition from the existing players who will always have first mover advantage. - Product yet to be launched in market (full first release in second half of 2018. Even though there is some competition in the digital advertising space, the technology that Papyrus wants to incorporate can make them unique in this space. Blockchain will be beneficial in that it will provide greater transparency and higher quality analytics. The team and advisors have experience in the advertising space which will be of added value. As with many highly competitive industries, especially digital advertising,the key here will be to establish some high level exposure to high level recognized brands and partnerships to help get exposure for the company. If a couple big names come aboard this will provide stepping stones to obtain traction. 3. On April 2018 Papyrus launched fully comprehensive Technical WP and on August 2018 - Business WP. Also we are going according our Road Map which never changed from the beginning and till now. 4. Papyrus products are unique and adapted to real business needs. The project has a clear plan and vision of further development as well as a very strong team of PhDs and expert engineers committed to build feasible blockchain solution for digital advertising market. The team becomes strengthened with world class advisors and business development people very well connected inside advertising industry to promote Papyrus adoption. Papyrus business development team is in talks on launching pilot projects with different market participants including brands, ad agencies, ad platforms and verification vendors. 5. Right now we already started pilot integrations on advertising market. 6. Our go-to-market strategy - we don't compete or replace existing market players, we rather integrate with them, providing with all the benefits of our platform. This is faster and more beneficial for everyone. We are a neutral solution that doesn’t compete with ad platforms and service providers while brings benefits for all of them unless they are making money in gray area. We connect advertisers, publishers, agencies, advertising platforms and verifiers within the Papyrus blockchain network to create trust, fairness and efficiency within the digital advertising market. Using Papyrus solution advertisers can always check how much of their money each publisher received, what performance of ad campaigns was registered by ad trackers, and what fees were given to service providers such as ad agencies, demand side platforms, supply side platforms. Also, advertisers can enforce their own anti-fraud and brand safety policies. As a result, advertisers have a clear view of all transactions and pay only for provided services. Extremely well thought out. I like the model, specifically that they are delivering code during the ICO process. Will be strong player in space as they get up and running. I have seen and monitoring this project since last year and yet the project is still under development. The only change I can see is that they up-sized the team. I sense that the team is just having a prolonged ICO to be funded. Hopefully I can see more products and actual outputs.